In August of 2004, we had 101 posts on Horsetales. A new record. I’m not sure how many members we had at that time, but looking back, some of the names are familiar today: Joni, Carol, Julie B, Jan Cz, Jamie, Sandy, Tami O, Robyn, Sam, Sherry and Shelly, to name a few. Other names I remember but they no longer post. I often wonder if they still “lurk”, got out of horses or lost interest in the day to day of Horsetales. No drama is guaranteed on our group – and it can become quite mundane at times. On New Year’s Eve 2004, my mom was diagnosed with pancreatic and liver cancer. Anyone who has dealt with “The Big C” knows that either of those alone aren’t good and together, the condition is grave. We knew there wasn’t much time and it was important that we spend as much of it as we could together. So each weekend one of my sons and I would drive the 150 miles to her home. We would talk, reminisce, she'd play games with her grandsons. We'd take care of estate business and then go for long car rides – just be together while we could. And when she would sleep, I would dial in to Horsetales. "Talk" of horses and spring plans kept me sane during an insane time in my life. By February, there were over 1,300 posts to Horsetales. And it was Horse Expo time. Expo 2005 was special. It was the first time many of us met face to face. Sandy hosted a small party and we were all relived to find out none of our new "invisible friends" were ax murderers, but very much like their online persona. And all horse crazy (Who has the picture from the party? I couldn’t find it?) It gave me a much needed hiatus from cancer. We buried mom later that month. 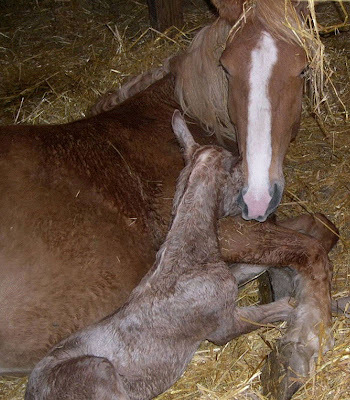 And for those of you who remember, my surprise filly, GinnyBelle, was born shortly after. After the Expo ice breaker, we started posting over 1,500 messages per month. Many of us met in early May for the annual Friday Before Mother’s Day Ride. And as the weather turned nice and plans were made for the 1st Annual Horsetales Trail Ride. 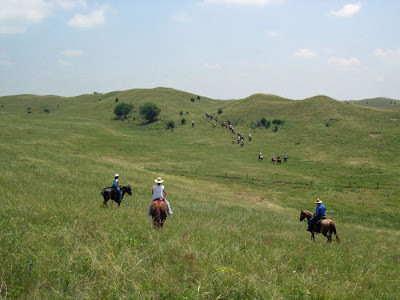 We decided to go to Calamus Ranch near Burwell. They say bad things come in threes. While on a day ride with some of the group in mid-May of that year, my horse spooked at the trailer pushing me against John's mare. She hit the end of her rope and came back down landing on my ankle. It was broken. The ankle already had plates and screws from an accident a few years prior and I feared another surgery. Luckily, the hardware held but I was ‘grounded’ for another 6 weeks. Right up to the Calamus trip. And if that wasn't enough, my heart was broken a couple days later when I lost my young gelding in a pasture accident. Once again, the Horsetales group was there for me. 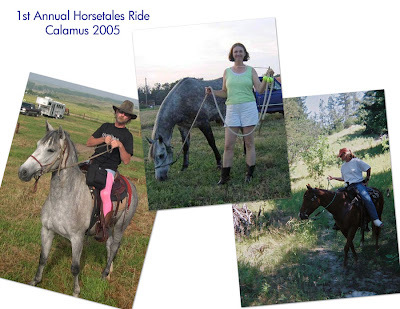 Buffalo burgers and spandex were the theme for the Calamus Ranch ride. It was the first horse camping trip for many. Lots of talk leading up to it fending off anxieties. I had the doctor recast my foot in one that would fit into a stirrup. We were good to go and it all worked out in the end with over 25 riders partaking in the adventure. Following that ride, posts to Horsetales increased to over 2,000 per month. It brought us all closer as friends. Our circle was widening, it was also tightening. This is cool to read some of how it all began. And I'm truly amazed that not only were you wanting to ride in a cast with a broken ankle, but you had a doctor willing enough to approve it and make it easier for you. Makes me feel like a slacker with my knee. lol! That photo with the pink spandex and cowboy boots on horseback made me giggle! Laughing... the cast to fit the stirrup seemed like a good idea AND it fit, but the angle of the cast didn't work right so I still had it hanging off like a loose appendage! Then I didn't account for running around the campground and cleaning out the trailer... and by the time we got back from that trip, I couldn't stand the smell of my cast! Once home, John to a saw and removed it for me. I still had a removable cast from a prior broken ankle, so I finished the treatment my way!